The one with the old man and that sea. The one with the catcher who was in the rye. The one with all the models. We may have slipped a new classic in there. 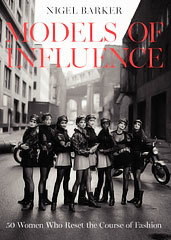 You can call it Models of Influence, a new photographic exploration into the beautiful world of beauty that contains 200 images of the most iconic models from the last 75 years, available as of today. This is from Nigel Barker, a guy who’s spent the last 20 years working with and photographing models all around the world. Nigel chose an admirable career path. Nigel is a nice man. In addition to all those pictures, it’s also got a bunch of personal info about each model. Right. Back to the pictures. You’ll see anyone from Twiggy to Gisele to other lovely humans who only have one name. There’s some two-namers in there as well.